Dolores Cannon’s method of hypnosis, Quantum Healing Hypnosis Technique℠ (QHHT®), involves inducing an individual into the Somnambulistic state of trance through visualization. A state which under ordinary circumstances is experienced only twice daily: the moment just before you become consciously awake and the moment just before you fall asleep. Historically, hypnotists have avoided conducting research with subjects in this state because of the often strange and inexplicable results that are recorded. 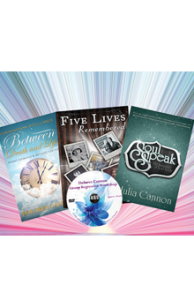 Dolores Cannon begun her research of lost knowledge and reincarnation in the late 1960s by developing QHHT® for past life regression sessions with her subjects. Not one to be limited by this disciplinary stigma, it was working with clients specifically in the Somnambulistic state and exploring the possibilities that led Dolores to discover that any individual can gain access to experiences of Past Lives they have lived. It was also exploring with clients in this state that she discovered an infinitely knowledgeable and powerful aspect of each individual that can be contacted and communicated with. This part of ourselves, as Dolores had learned, is always present with us and exists just below the surface of our conscious mind, so she appropriately chose to label it The Subconscious. The Subconscious is what gave her and practitioners of her QHHT® technique access to past lives and performs instantaneous healings when appropriate. Over her 45-year career, her technique has proven to be effective on thousands of people all over the world regardless of their Age, Gender, Personality, Physical Symptoms, Religious Beliefs or Cultural Backgrounds. Supplementing the vast body of work Dolores had produced, the results experienced by QHHT® Practitioners, students of Dolores who have learned her technique and practice it with their own clients, conclusively support the finding that we have all lived multiple Other Lives and we all have a Subconscious which contains the answers to any question we may have about ourselves or the life we are living. Past Life Regression is the first component of Dolores’ QHHT® technique and involves the individual being regressed and guided through an appropriate past life from the first scene they first view, throughout the various periods of the life and eventually through to the death scene. The Subconscious will select what past life to show the individual and they will be guided through it by the QHHT® practitioner conducting the session. The past life the Subconscious chooses to show an individual is always relevant to the current life the individual is living now and it is not uncommon for multiple Past Lives to be shown during a single session. The QHHT® practitioner will navigate an individual through a Past Life using a series of questions to help determine the time period and social setting of the life. The Subconscious that was contacted by Dolores and the practitioners of her QHHT® technique is the polar opposite to the subconscious referred to by psychologists and conventional medical professionals. During her early years as a hypnotherapist, Dolores became aware that through her unique technique of induction she was contacting and communicating with a portion of an individual’s consciousness that was indeed a part of them, yet lay far above the level of their conscious mind, which is the part of ourselves we are aware of and use to interact with others on a personal level.The Subconscious is a suitable label given the context of Dolores’ work; however, religions and spiritual teachers alike have attempted to identify and label this larger part of ourselves throughout history using a variety of different labels: the Higher Self, the Oversoul, Christ Consciousness, Higher Consciousness, the Universal Mind and Oneness. The Subconscious had stated to Dolores that it does not care what we call it, it simply ‘Is’ and is willing to work with those with a pure heart and true intent. Dolores’ main objective was always to help improve the lives of the clients she worked with. Therefore, the purpose of working with the Subconscious is always to help an individual to the greatest extent possible in whatever capacity possible. This help can come in many different ways. The Subconscious knows everything there is to know about an individual and the life they are living now, so one of the first actions taken by the QHHT® Practitioner is to ask the Subconscious the questions an individual has about their own life. Obtaining this information on behalf of the individual is crucial to the healing aspect of the technique as it provides them with comfort, support and greater understanding in many different areas of their life. The Subconscious will only choose to share information that is appropriate at the time and information that will only be of benefit to the individual. The explanation the Subconscious gives for why we experience disease will most certainly challenge the belief systems of many people in our current medical and scientific paradigms. As we move through this time of great change and transition, many people are indeed stretching their belief systems to incorporate new ideas and concepts by seeking out alternative information that mainstream science has either dispelled or ignored. Many long held paradigms of accepted thought are beginning to crumble and are slowly being replaced by concepts and ideas that can no longer be suppressed as a result of the Internet and instantaneous communication all over the world. In order to understand the Subconscious and this component of Dolores’ QHHT® technique, you will have to stretch your belief system to enable you to understand the following concepts in the context they are given. The goal here is not to convince you of anything you are not ready to accept, nor is it to persuade you to reject anything you are not ready to disregard, it is simply to provide you with a platform upon which you can understand how Dolores’ QHHT® technique works and how the results it achieves are possible. The Subconscious has the ability to identify any physical problem it detects within the body to a QHHT® Practitioner and explain the causes for its presence, be it from the current life or a past life. The Subconscious is then asked if it is suitable for healing to occur, which, if it is, is done instantaneously with no medication, surgery or pain involved. Very often, simply understanding why a disease is present or why a particular emotion is being experienced is sufficient for it to be relieved and removed by the Subconscious. There are no guarantees, but these are some of the remarkable results Dolores and her QHHT® Practitioners alike have experienced during sessions.